H x W: 10 in. / 16 in. 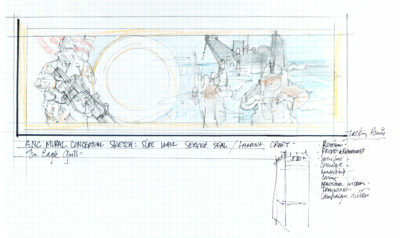 This drawing of Navy Seals exiting a landing craft over an unfinished sketch of a service seal is one of seven mural sketches by William Woodward, commissioned by the Club for the Eagle Grill to commemorate the many military personnel who have sacrificed their lives during recent conflicts in the Middle East. A third-generation native Washingtonian, Woodward is among America’s most admired classically trained painters and a professor of art at George Washington University. He specializes in large-scale historical murals, which he has created for numerous public buildings, including the Lincoln National Monument, and many historic residences, including James Madison’s Montpelier and Thomas Jefferson’s Monticello. He is a frequent guest speaker at venues such as the National Gallery of Art and the Smithsonian Institution in Washington, D.C.